Ward Nurse from Lower Hutt. To the long term crew onboard Robyn is affectionately known as a ‘repeat offender’. 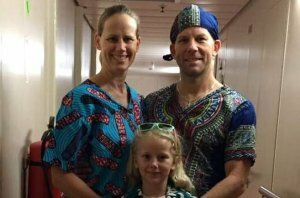 This Guinea field service was her eighth self-funded, three-month trip volunteering on the Mercy Ship providing post-operative surgical care during the field services the hospital ship was docked in Congo, Benin, Madagascar, Cameroon and Guinea. ‘I normally nurse adults,’ Robyn explains, ‘but looking after children here adds to the best part of it. 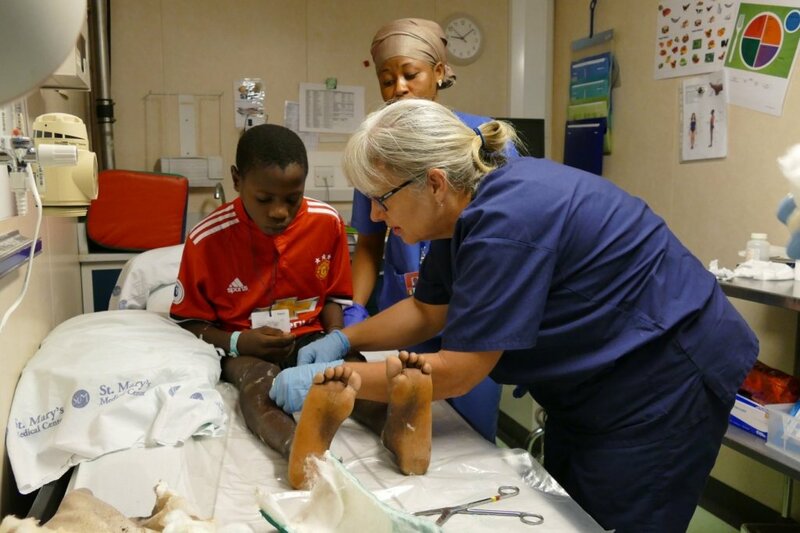 They just become part of you and I miss them terribly when they are discharged from the ship wards.’ Her work in Guinea included the care of children like Sema, who received major surgery to correct his extremely bowed legs. Sometimes she was assigned to the ‘burns’ ward where both children and adults recovered after surgery released joints previously immobilised by deep scars resulting from horrendous burns. Robyn’s early work onboard also included the care of girls and women receiving restorative surgery after traumatic birth injuries. 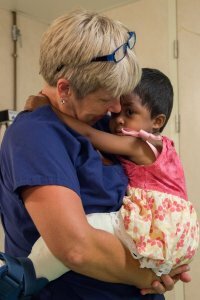 In each ward, Robyn treated and ‘loved-on’ the patents in a way that is uniquely Mercy Ships. The lack of access to safe surgery results in more deaths worldwide every year than HIV, tuberculosis and malaria combined, according to The Lancet Commission on Global Surgery. 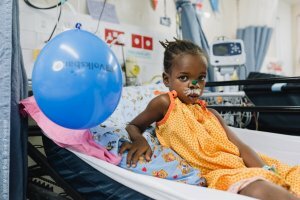 For nearly 40 years Mercy Ships, the hospital-ship charity, has quietly made it a priority to provide safe surgery for people in developing nations who otherwise would have no options. The field of service for the Africa Mercy is primarily West Africa, where the international volunteer crew of 450 spend 10 months at a time in a nation at the invitation of the local government. The protocol promises the provision of free surgical care in ophthalmic, maxilla facial, burns and plastics, obstetric fistula, cleft lip and palate and orthopaedic specialties for people in poverty. 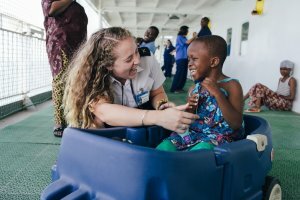 Building the capacity of country’s existing health care workers is a second track of growing emphasis for Mercy Ships. The Africa Mercy has five operating theatres, five wards and all the required axillary services such as radiology, pharmacy and pathology. Ponseti, physiotherapy and rehabilitation services, ophthalmic and dental clinics are facilitated ashore – all without charge to the patients. Tony found his role on the hospital ship to be both compelling and rewarding. In recent months during the current field service in Cameroon, West Africa he was called upon to help out a local hospital. ‘We found out that a hospital had an x-ray machine that was not working despite three attempts to repair it. It was the only x-ray machine in a region with a very large population. ‘The machine was brought from the other end of the country to the port city for us to look at. The machine was almost 30 years old, and we had to do the repairs to component level, which is uncommon these days. We were able to fault find and repair it. We replaced some other old parts and gave it some much needed general maintenance. During each field service in a different African nation, Mercy Ships provides Biomedical Technician training. 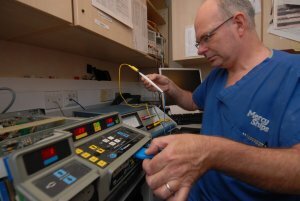 It is a means to improve a country’s overall healthcare ecosystem and to improve biomed services by providing assignments and projects designed to help technicians improve their understanding of equipment diagnostics and repair techniques. It helps the local participants to take ownership of their biomedical engineering service, to learn and apply these skills to enhance their professional interactions with clinical personnel and hospital management. They often need to be reminded that they are a valuable part of the healthcare team. 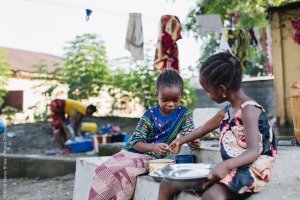 During the recent August 2017-June 2018 field service in Cameroon, Mercy Ships collaborated with the capital city’s hospital and with the Ministry of Health to provide repairs and renovations. This work was done in line with the hospital’s planning that was carried out for the biomedical workshop. 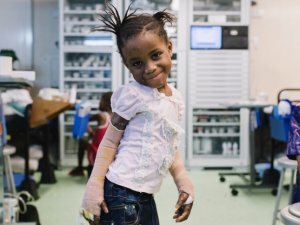 Once the renovation work was completed, Mercy Ships returned the facility to the hospital and the Ministry of Health for their continued use. 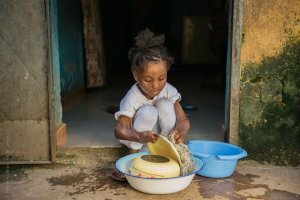 This increased the sustainability of the mercy Ships field service as the facility will remain in operation long after the Africa Mercy departs. The facility was used during the field service for the Biomedical Technician Training project, during which 28 Cameroonian biomedical technicians attended training courses run by Mercy Ships. There is nothing more heartbreaking for a parent than watching their child struggle through basic tasks because of something they can’t control. Ibrahima knows this pain well, from watching not one, but two of his children suffer from an orthopaedic condition known as Genu Varum or bowed legs. This malady, often a result of malnutrition, causes the bones in the legs to bend outwards — making it increasingly difficult and even painful to walk. For years, Ibrahima prayed for a way to take away his children’s pain, and in 2012 he heard the news that he so desperately needed. 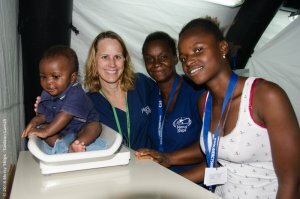 Mercy Ships had arrived in Guinea offering to provide safe and free medical care to those in need. During that time, he was able to bring his older son to the Africa Mercy to correct his legs — an answered prayer for Ibrahima. Unfortunately, for his younger daughter, N’nady, healing was still out of reach. At the time, she was staying with relatives in a remote village deep in the rugged country and wasn’t able to travel to the ship in time for surgery. Years passed, and while he was grateful for his son’s healing, Ibrahima felt both grief and guilt that he wasn’t able to provide the same for his daughter. While it was difficult to see his daughter in pain, he never gave up hope that the ship would return and that N’nady would have a chance for healing. Six years later, the Africa Mercy returned to Guinea, and N’nady’s family rejoiced. ‘I’m so happy I can’t even eat… I’m so excited to see her healed,’ Ibrahima exclaimed. 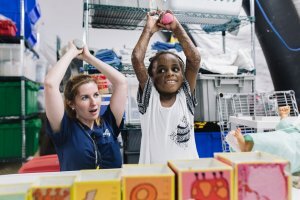 The enthusiasm he felt must have been contagious because, after surgery, N’nady shot through her recovery at lightning speed tackling her rehab exercises with the same sweet, shy smile she always wore. By the time N’Nady and her Dad left the ship to return home, many weeks had passed, yet Ibrahima looked years younger, sharing his overwhelming gratitude. Now, with N’nady’s legs straightened, it is easier for her to walk without being in pain or mocked. N’nady and her father both agree that she’ll be going back to school as soon as possible — although they have different opinions about what comes next. Ibrahima dreams of his daughter becoming a doctor, but N’nady dreams of one day becoming a tailor and making dresses. Whatever she becomes, N’Nady finds joy in knowing that her options are wider than ever. Ousman was excited to receive the call from his sister saying that his niece had finally been born. However, that excitement quickly turned into heartache once he learned that baby Aminata had been born with a cleft lip. When he heard the distress in his sister’s voice, Ousman felt desperate to help both her and her child. As she grew, young Aminata’s condition began to cause malnutrition, making her body develop very slowly. 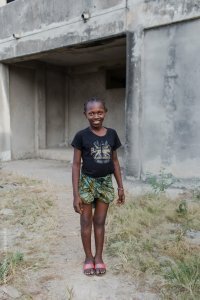 At eight years old, Aminata’s height and build resembled that of her four-year-old cousin’s. Because she was ashamed of the way she ate, she refused to eat in public and instead, would only nibble on meals that were placed around the house for her to find. After eight years and several failed attempts to find a solution, the family had all but given up. One day, Ousman heard an advertisement on the radio about a ship that offered free surgeries. After hearing about the patient selection process, he wasted no time in rushing to collect Aminata from the village. Unfortunately, by the time he returned to the capital, they had missed the screening. Ousman, however, was not ready to give up. 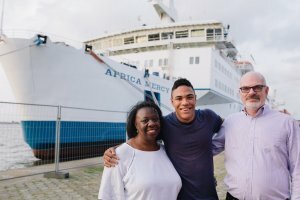 He took Aminata straight to the Africa Mercy to see if there was anything Mercy Ships could do to help her. Once Aminata was accepted as a patient, Ousman was excited to make the call to his sister letting her know the fantastic news — Aminata was going to receive surgery! Following the surgery, Aminata was able to heal knowing that her family had never given up on her. In the morning Confort put on a pot of boiling water to make some rice for her hungry daughters. She never imagined it would be the start of a nightmare for her family. One-year-old Gamai, who had just started walking, toddled past the pot knocking it over as she fell. As the piping hot water spilled onto her torso, her piercing screams transcended through the house to her mother’s ears. The world around Confort fell silent as she tried to comfort her child. Confort and her husband rushed Gamai to the local hospital but were only able to afford some ointment for the pain. Not knowing what else to do, they reluctantly watched their little girl grow over the next few years with contracted hands and arms, severely limiting her mobility. Attempts to live their normal lives began taking its toll on the family due to the scorn Gamai faced from other people. Gamai on the ward after surgery. 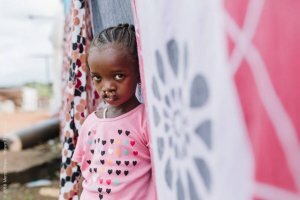 Then one day, in the midst of Confort’s anxiety, she learned of an opportunity for people to receive restored mobility from an operation — a specialty of Mercy Ships. When the ship arrived in Guinea, Confort made the brave journey with Gamai — now 4 years old – out of the family compound to the patient selection site. There she was met by fellow mothers who had gone through similar accidents with their children, and she began to feel at ease. That same ease developed into hope, which eventually grew into excitement as Gamai was selected for surgery onboard the Africa Mercy. “I am filled with happiness that being hidden will not be Gamai’s future,’ says Confort. But even after surgery, the journey wasn’t complete. Weeks of painful rehabilitation began, and Confort had to listen to the same cries that she’d tried so hard to settle over the past three years. ‘It pains me to hear her hurting, but I know it needs to happen,’ she said. Gamai during one of her physiotherapy sessions. When the day finally came for Gamai to leave the ship, no one could have guessed she’d spent the majority of her life behind closed doors. Engaging and full of life, she leapt for joy as she played with her new-found friends — children that neither mocked her nor stared at her for being different. Unable to lift her hands above her head before surgery, Gamai can now reach higher in life than she ever could before. While not on duty, one of Esther’s favourite things to do is be a ‘buddy’ to one of the paediatric patients onboard for surgery. 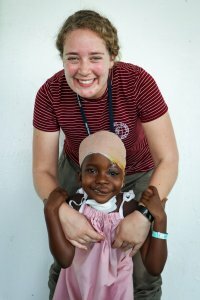 Five-year-old M’Muh, pictured here with Esther, had a long recovery after free surgery removed the benign growth that drooped over her forehead like a sack and was beginning to dislodge her eye. In the weeks following M’Muh’s operation, Esther’s TLC and fun-loving games worked alongside state-of-the-art medical care to see the little girl emerge from her shell of rejection and meet the world with a grin. Since the Sunday team was on board, Esther took up a new role in the ship’s housekeeping department. She totally loves the fun working with her international crewmates swabbing the decks and keep the ship in, well, ship-shape.